He has been named to The Best Lawyers in America list. Recipient of the prestigious AV-rating* from Martindale-Hubbell. Treating our clients like family isn't a catchy phrase to us, it is the foundation of our legal practice. We form a personal bond with our clients, allowing us to understand your particular needs so that we can best represent you. The Law Offices of John M. McCabe Law Offices, P.A. 9:00 A.M. to 5:30 P.M., Monday Through Friday Weekend & After-Hours Appointments are Always Available/We will Travel to You If You Cannot Come to Our Office. 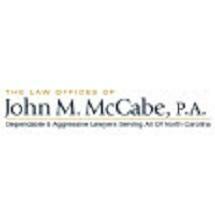 If you or a loved one has been injured in a car accident in the Raleigh area, you can rely on The Law Offices of John M. McCabe, P.A., to stand up to the insurance companies and make sure you are being treated fairly. If you or a loved one has been injured, or you have lost a family member in a trucking accident, we can help you get the respect you deserve from the insurance companies. We work hard to obtain the workers' compensation benefits our clients are entitled to. Our team will strive to ensure that you are treated with the respect you deserve from your employer and its insurance carrier. Our commitment to clients' rights is reflected by our results: We have achieved dozens of six- and seven-figure settlement and jury awards.